My initial idea of blogging weekly seems to have fallen by the wayside. There simply are not enough hours in the week for me to get it all done. Last Sunday was Mother's Day. What a special day that was for me. My husband makes sure the kids give me a special day. I had breakfast in bed on Saturday since Jeremy leaves so early on Sunday mornings. It was perfect! A bagel, sliced apple, and a glass of orange juice. I know I mention this a lot but I sure am blessed to have these five blessings in my life. God will always be first, Jeremy is second, and my kids are third. How they make me laugh!!! We finally had some warmer weather this week and the kids enjoyed much more free-time. For the most part they finished school. There are always a few math lessons, and reading to be done but they are done well before lunch. Becca has been keeping a watchful eye on a robin's nest. One of the babies was out of the nest but still not taking to flight yet. Becca was thrilled to see this bird up close. Wednesday was our closing ceremony for AWANA. I was so proud of all of my kids. Micah earned the Timothy Award this year. This means he memorized every verse of every section of every AWANA book! This was not easy and he was grinning as he was awarded his trophy. Becca finished her book and much of the extra credit sections too! Benjamin also finished his first Truth in Training book as well. It was a great evening. This year was Kyle's second year to help in AWANA. He assists Jeremy with game time. He loves it and Jeremy enjoys seeing Kyle with the kids! Kyle had a companion in the pew as well. This marked Jeremy's 14th year serving in the AWANA ministry. He truly loves kids! We got up bright and early Thursday morning and headed to Pittsburgh at 7am for a second opinion for Mariah. After reading countless websites and having conversations with other moms, I have known for a long time that our beloved endocrinologist was not exactly a great fit for Mariah. We arrived at my parent's house at 10:30am and the kids went straight out to the yard to play. Let's just say we were glad to arrive. Mariah still is not a good traveler. While the kids enjoyed "playing", Jeremy and I headed to Pittsburgh with Mariah. We crossed the Fortieth Street Bridge and were there in about 40 minutes. What an amazing facility. This hospital is new and WOW!!!! We know it since Ben also goes here. Our appointment was for 1pm.......Mariah's naptime! After spending an hour with two endocrinologists and another 45 minutes with a nurse practitioner, we were sent to a nurse educator down the hall. This is when it all caught up with Mariah. I noticed her swaying on the gurney. Sure enough, she was asleep! So I helped her lie down. Poor thing was so tired! Here we met with a urologist (they have a team approach to Mariah's care). We had no idea we had this appointment with the urologist. It just so happened to be Ben's urologist! What a blessing! I have an appointment with Mariah at the pediatrician's office this week. I need to see if our pediatrician will write a letter to our insurance stating that it is medically necessary for Mariah to be seen out of state. These doctors were amazing. They lowered her medication and told us it was just too strong. This may be the reason for elevated blood pressures. We were taught many things. We were told the safest place for Mariah is at home in the case of an illness. Unfortunately, we know more about her condition than most health care providers, including doctors. That was a little humbling. We would love to switch to Pittsburgh. This new endocrinologist also said she would be happy to see Ben there as well. Yes, my dad taught Kyle how to drive a stick shift! He only had trouble finding third gear. It was safe to say that Mariah did not like the quad or any thing else that was noisy. She often ran when she heard them come near. The hospital was terrific and gave us so much information! I wish we had this information months ago. I knew a lot since I have researched almost every night for months. But wow!!! Impressed would be a gross understatement! Mariah loved the train/trolley exhibits! And the Lego replica of Children's Hospital of Pittsburgh. She made the doctors and nurse a little anxious with her stunts! She just wanted to jump off of the stool. That is what it is for, right? We walked back in the door of our house at 11:45pm. It was a very long day. Her appointments took 4 1/2 hours. 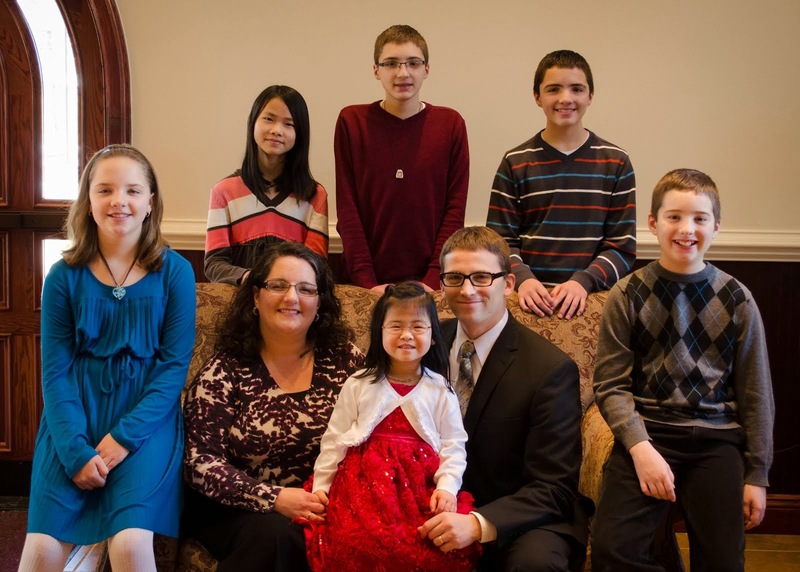 Friday morning was our one year post-placement report for Mariah's adoption. Our social worker came at 11 and left about 12:30pm. Hard to believe it is almost a year! Trumpet lessons were at 2pm and our day was slow after that! I need a vacation! I get weary from the phone calls about insurance, labs, appointments, and just generally people not doing their job. Why do I have to get involved? Sometimes it feels like we are fighting the world. Then I have a wake-up call and realize that this is what I am called to do. I am meant to advocate for our children. God put me in this exact place at this exact time for a reason. I need to find the joy in these circumstances. Our kids depend on me for this reason. The phone calls are non-stop and the paperwork is never-ending. But the love I receive from those five blessings is more than worth it all. I love serving the Lord with all my heart! I love being Jeremy's wife. I love being a mom. Lord, help me when I fail. Help me to seek your face every minute of every day. Help me to seek wisdom from you and none other. Help me to be a better wife, mother, daughter, sister, and friend. I guess it has been a couple of weeks since I updated our lives. It has been somewhat eventful. But isn't that normal for a house full of five kids? We are still going full speed ahead on our schooling. Check out the newest student. Kyle was watching the introduction to his newest math chapter. Steve Demme would be proud to see his likely youngest Algebra student! Did you notice how close she sits next to the television? We constantly remind her to move back. She enjoyed it for the entire time. I am hoping to wrap up my part of home schooling this week! I am a tad excited!!! The kids still have a few more weeks worth of math and Kyle needs to finish up his science. We also received an exciting piece of mail. Kyle received his very first passport. He is just about ready to head out on his mission trip to Mexico. We desperately needed to get out and work on some of our landscaping. Mariah loves to be outside so she decided to explore little. All of the kids helped out. Kyle was cleaning up the ornamental grass that we cut back. Micah was our rake man! He worked on the clean-up detail. Becca was happy to work on weeding detail. Ben also weeded.....and played.......and weeded.........and played! The girls got showers and it was cute to see them in matching nightgowns. Yesterday was Mariah's first time to attend Sunday School. Mrs. Janice is such a sweet teacher. She reminds me so much of my mom. I needed to make sure everyone was comfortable with Mariah in that class knowing the necessary urgency to contact me or Jeremy in case of emergency. Mrs. Janice was happy to receive her. What a blessing Mrs. Janice is! Then today Kyle went upstairs to get Mariah up from her nap. Like I have said before, she is a great sleeper! He brought her downstairs to the kitchen and asked me if this is what she had on when I put her down for her nap. Notice anything a little different? She was able to reach a stack of clothes on a chair beside her crib and decided to dress herself, again. I think she did a great job! Even though the shirt is backwards and inside out, she got it on. Mariah is beginning to want independence. It is a little amazing to me to watch her with a washcloth in the tub. She really scrubs well! 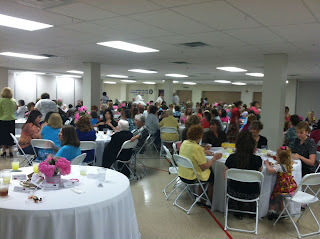 I wish I would have remembered to take my camera to our Ladies' Spring Banquet at the church. Notice the beautiful flowers in the foreground of this picture.....I won those flowers. It was amazing! Our ladies did a fantastic job. 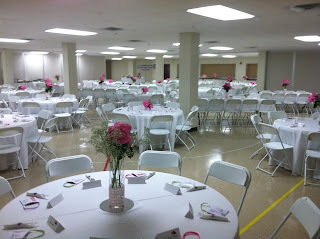 I was overwhelmed with the sheer beauty and organization of the entire event. Not a single detail was overlooked. Two hundred thirty women attended this banquet. The guest speaker was Geraldine and Ricky. Geraldine Reagan is a ventriloquist with her dummy "Ricky". We had such a wonderful time. Many of the men from the church served the food that was prepared by Diane, Sandy, and Carla. The food was delicious! Not a single picture from me. That is so unlike me.